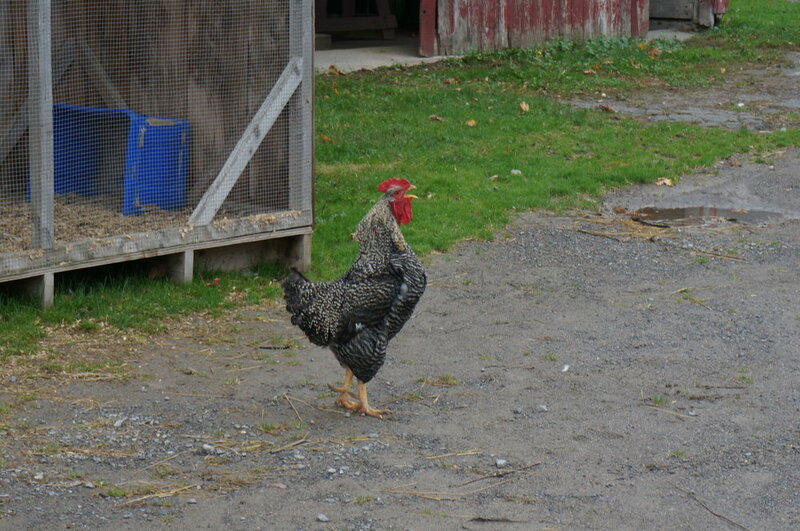 Hagerman Farms: A cute farm with lots of cows, chickens, turkeys, goats and a pig. We ended up shopping here near the end of the day, bought home some produce and explored the farm. Dead People's Stuff: Worth a visit to peruse the antiques from the past and pick up a trinket or two. June Motel: A refurbished motel turned trendy millennial pink stay. We didn't stay the night, but dropped by to take a look. Definitely noticed the pink doors as we drove by and a cute addition to the County. Drake Devonshire Inn: Everyone's first visit to PEC should include Drake Devonshire and that's how we were introduced to PEC three years ago with one of our friend's having their wedding at the inn. Set by Lake Ontario, the view of the lake in any season is scenic and the interior space of the inn is fun to explore. Most importantly, the food is delicious! The Vic Cafe: Cute, small brunch spot in downtown Picton worth visiting! Karlo Winery: This winery was recommended by several friends and it's a lovely winery to visit. Set inside a barn, it gave us a very seasonal, cozy holiday vibe. For all the animal lovers out there, their wine is certified vegan! County Cider Company: Cider flight tastings at $2, a pizza oven with a restaurant viewing the lake and its at a barn means we will be revisiting this cidery. The restaurant was closed for the season already when we visited. We bought several bottles of cider and highly recommend getting the pear cider. Lil Bake Shop: This tiny shop is all about the honour system. Step in and there are baked goods from croissants to brownies and a small coffee machine. Pay and take your goods with you. This self-served shop makes us love PEC even more. The past three times I drove out of the county, it rained. We'll certainly be back and cross our fingers it'll be sunny on the way out. I like pancakes berry much! With our crappy rainy summer, the blueberries were huge due to water absorption. Blueberries are sweeter in mid-August. Early August harvesting results in a sweet-basil flavour. Picking berries is hard work. I pretty much gave up by the end of our 2 hour harvest. I swear I wasn't complaining like a 3 year old. Blueberries are gentle - they fall off from the bush easily. After padding ourselves on the back for two buckets full of blueberries, we treated ourselves to their famed locally grown, organic blueberry ice cream was delicious. Or, we were so exhausted that we needed any pick-me-up. What did we do with our two pails of blueberries? Ate them as in, made a smoothie, or added them to a chia pudding. The best one was making blueberry pancakes for brunch and enjoying the beautiful weather in the backyard. We followed J. Kenji Lopez Alt''s The Food Lab's recipe on extra fluffy pancakes. The key difference between previous recipes and this one was beating the egg white separately until stiff peaks before mixing it with the rest of the ingredients. The reason for doing that is to make the pancakes extra fluffy. 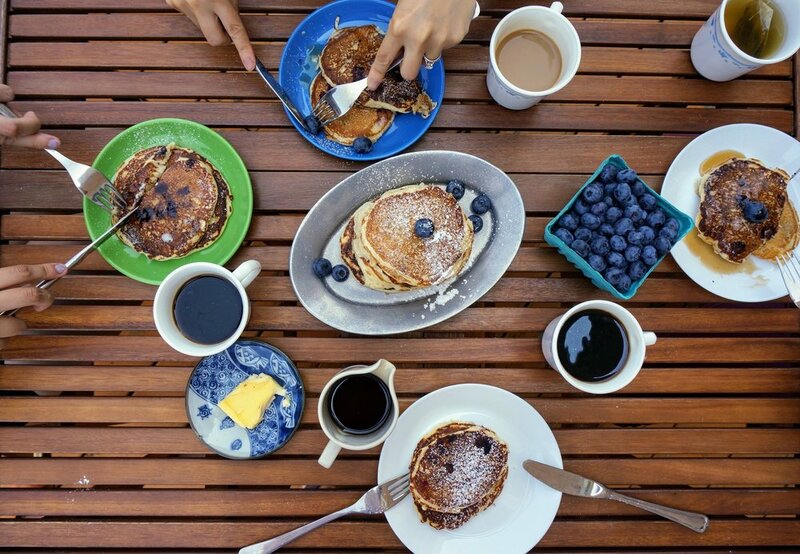 The blueberries had the right amount of tartness, along with some decadent maple syrup on top of pancakes - we call that a successful Sunday brunch. And of course, topped with the best of friends, what else can we ask for?